Whether your hair is short and thin, long and curly, straight and sleek, or totally unmanageable, you want a brush that can tame your locks and make your hair look shiny and put-together. But finding the perfect brush is harder than you might think. The overwhelming variety of brushes on the market means there is an enormous amount of trial and error involved. You want a brush that you can use whether your hair is wet or dry, and that can effectively untangle your hair when it is knotty or style it when you're using a blow dryer and aiming for a specific look. A large oval brush is undoubtedly the way to go. Able to serve all your hair brush needs, a large oval shape allows for maximal coverage, allowing for a smooth and consistent look. The oval shape is especially good for styling with a blow dryer, flat iron, or curling iron. A large brush is an excellent choice because it makes for efficient hair brushing by covering a lot of your head all at once, and this type of brush will keep your locks looking smooth, sleek, and shiny. Picking the right brush for your hair can be a nightmare. The great part about a large oval brush is that it will work for you whether your hair is short or long, super curly or stick straight, thick or relatively thin. Don't worry about finding a specialized brush for your hair type. All you need is a large brush in this terrific oval shape to fit your needs. 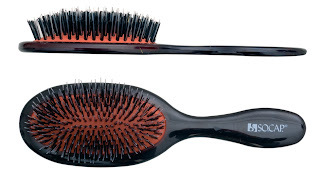 Getting an oval brush may seem irrelevant, but in fact the oval shape is very helpful for styling and untangling hair. Many people choose round brushes because they believe they are easier for styling with a blow dryer, but in fact an oval brush is the most versatile and useful shaped brush because it's an excellent brush for your styling needs but can also be used as a more basic brush for smoothing out and untangling your hair. Consider all the options when picking out your brush. There are many types of bristles, degrees of cushioning, and different handles out there. Get a brush that feels comfortable in your hand, with bristles that don't irritate or hurt your scalp. But most of all, you should be certain to choose a brush with a large oval shape. Perfect for styling, perfect for untangling, and perfect for getting the most out of your hair brush, large oval-shaped brushes are undoubtedly the best option on the market today. I like that brush as it is very gentle to the scalp. It is perfect for the long and curly hair. I make sure to bathe with moroccan oil shampoo and conditioner and use a similar comb to massage the scalp and comb the hair.